This blog is devoted to non-objective photography, especially photography created solely with light and chemicals, the camera being entirely optional. We will discuss, analyze, teach and promote this work. 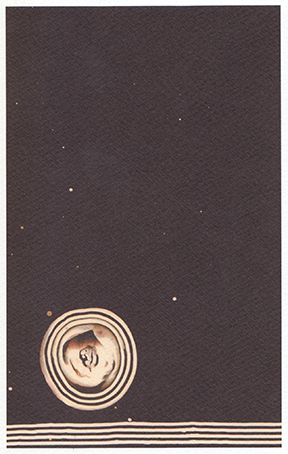 Meanwhile, the Brussels editor and gallerist Jean Marchetti approached Pierre and asked him if he could illustrate a delicate, bristly, highly charged, nearly unfathomable text entitled L'en-allée by the French poet Yaël Cange. 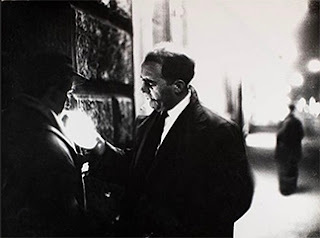 It was understood now that they were a team, Pierre and Gundi, and they accepted - yet without having the vaguest idea how challenging the poems of this writer, whom neither had heard of, were to be. In the early months of 2012 they settled on a strategy of thinking about key words in both the poems and in the poet's life as a way to steer their work. 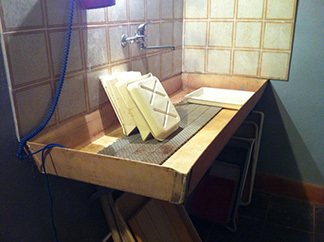 Gundi took the lead in coming up with sketches and mock-ups, which together they would criticize, modify, redo, and develop further around the table in Pierre's studio. They put the Pair-Impair project for the while on quasi-hold. The title, L'en-allée, a seldom-used expression, is nowadays shrouded in high-poetic fog from the 19th century, perhaps from Valéry, and conveys the sense of 'setting out' or 'leaving for', of seeking what was once there but no longer is, yet it also contains the idea of just 'going away' or decamping, wandering, perhaps to unknown or undisclosed destinations, with many stages and hesitations. 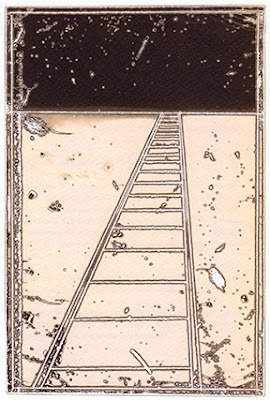 It speaks of memory and loss, and the possibility of redemption at the end of a trajectory that may be as long as a lifetime, or of the despair of not attaining it at all. In more recent literature it has been associated with the curt, aphoristic writing of the novelist Marguerite Duras. 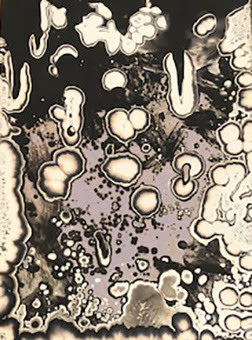 So when Cordier & Falk began producing material for the book, it was apparent their images would resemble 'normal' chemigram images such as seen in work across many artistic practices today, only slightly. Nor would they be expected to, given their radical assignment. We are in an oneiric world here. In grappling with the tortured verses of Yaël Cange, the artists had to invent their own symbolic language of response and stake out their own territory, which may have represented also a sort of pushback, gently done, leavened at times with sly humor. We find fragments of eyes, floating gamely, of ears and lips, of railway tracks leading blindly nowhere, of stars with the softness of a child's dream, diagrams of past and future, mandalas, blips suspended in space, erasures. 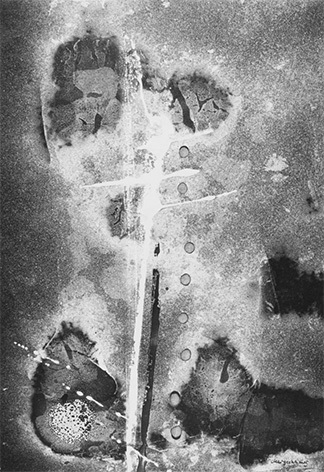 For all that, the making of the marks on paper obeys what we expect of the chemigram procedure, following the rules of the trade: a puncture is begun somewhere, a cut, an abrasion, and it grows in time and space as the paper gets alternately bathed in fixer and developer. The artists watch, terminating the action when they deem the moment right. Nothing could be more straightforward. Still, it is remarkable that Cordier and Falk have found a way to strip away years of refinement in chemigrams to arrive at an almost infantile level of attack, especially in the midst of creating their sophisticated suite Pair-Impair. In so doing, they have managed the unexpected feat of matching poetry with poetry. We hear that Madame Cange was well satisfied with the work. 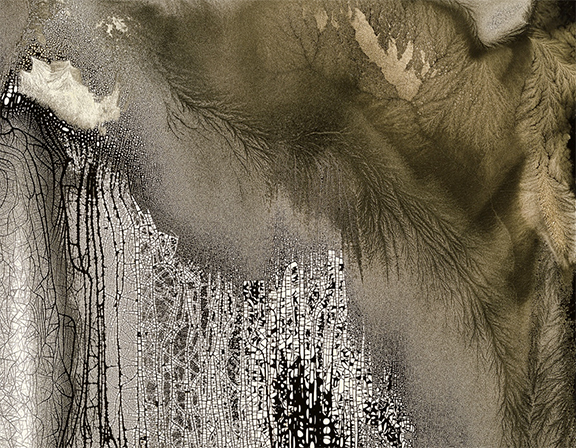 The book was printed at the end of May 2012, just days after the last chemigram left the water wash, in an edition of 600 copies on fine rag paper. It is still available from the publisher, La Pierre d'Alun, Brussels, and elsewhere on the internet. Definitely an item you may want to collect. If you see a very tall gentleman striding down West 40th Street in Manhattan whispering mantras to himself in an Asiatic language, possibly a dead one, it's most certainly Edgar Hartley, known also as Upasaka Bodhisattva, absently preparing himself for a day's work in the darkroom. 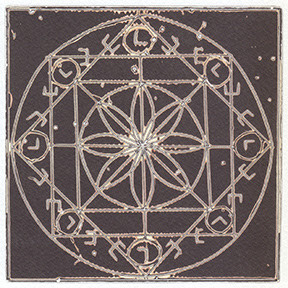 When I first knew him this was not on the program: he was mainly concerned then with the devising of warding sigils, amulets and protective seals for the summoning and healing of spirits - a specialized occupation to be sure - but in recent years he has transitioned smoothly into printmaking and cameraless photography. Are the two related, wards and prints? In his hands they most certainly are. In fact you probably can't truly appreciate the accomplishment of his new show, Grinding Iron Rods Into Needles, at Manhattan Graphics, February 1 to February 28, without seeing how they inform and interpenetrate one another. I'll let you explore those connections on your own since I admit my scant knowledge of the magick arts, yes that's a 'k', my loss to be certain. Come to the opening reception Saturday, February 16 to meet the artist and discuss your sigils with the Bodhisattva himself. For those unfamiliar with Tang dynasty chengyu, or idioms, it's helpful for starters to shed light on the show's title. 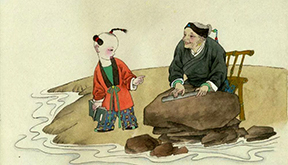 The story goes that one day in the 9th century young Li Bai encountered an old woman by a stream. She was beating an iron rod between two stones. What are you doing, Li Bai asked. I'm beating this iron rod into a needle. Let me try, he said, and he tried for a minute or two and gave up, saying this is crazy. No it's not, the woman said. If you keep doing it again and again, you will eventually have a needle, it's all about perseverance. Li Bai left her and thought about this, and later would become the greatest poet in the history of China. So much for background. Let's turn to the work and see what we can learn from it. 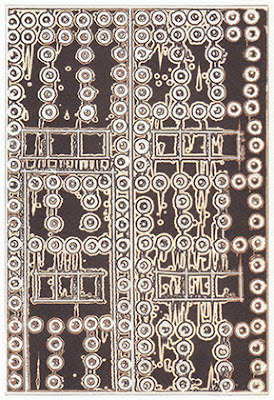 On Chronos, pictured here, Edgar has used several resists that have become popular of late (cf. our post last month on soft resists) including guava paste and oil spray. 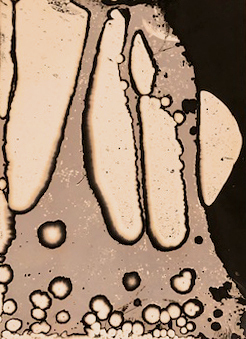 Soluvar by Liquitex was the hard resist, and he used varying amounts of stabilizer, or ammonium thiocyanate, on this and all the other darkroom pieces in the show. I suspect he may have dampened the warmtone here with a bit of selenium, judging from the sober quality of the red, although he's mum on that. 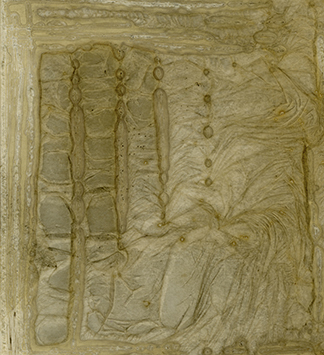 For The Warding at the top, Soluvar and tape were the resists (no guavas there) but the major difference lies in his use of bleach-etch methods, a newer tool in his box, to soften the surface and give it a suitably sensuous effect. To create the Fomatone image the artist used both brush and tape, although the dominant gestures arise clearly from bleach-etch, as they do also in Your Phenomena, where the hard resists, MSA Varnish by Golden and Soluvar by Liquitex, are barely perceptible however past the veils of floating emulsion. As Edgar tends to work on small format paper, for a show like this, where most of the pictures are 16 x 20 inch C-prints, hi-resolution scanning can play an important role in how things get viewed and loved by the public. David at Print Space, West 21st Street, stepped in and scanned the originals at 1600 dpi and some even as high as 2400 dpi, and then did all the printing on Kodak Endura. You won't want to miss seeing the results. 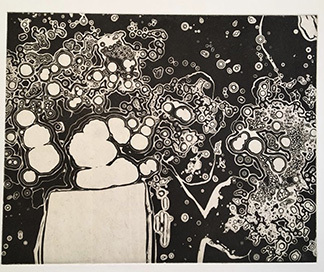 It's only fair to add that this show includes an assortment of other printmaking endeavors by the Bodhisattva: paper litho, collagraphy, photogravure, etching, even silkscreen. But you know why we aren't talking about them. His website is www.edgarhartley.com. Paloma Boyewa-Osborne lives in the Morningside Heights area of Harlem. She has been painting and drawing since age 3, although none of that work has come down to us. Her family introduced her to the chemical darkroom a couple of years ago and today, at the advanced age of eleven, she knows her way around it with disarming confidence. 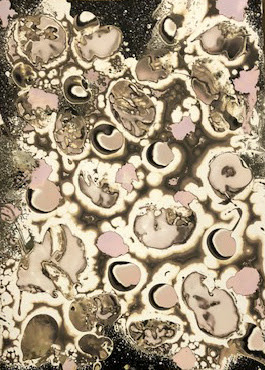 Last week she participated in a chemigram workshop at the International Center of Photography in New York and produced a group of works in soft resists that caught our attention and then some. A cautionary note: in sharing these, we implicitly reject the antediluvian notion that success in abstract cameraless photography (or of any art) must be linked to physical maturity, which so often is unstated and assumed. It doesn't. Paloma is living proof if you needed any, and we won't say anything further about it. Let's look at what she did, and then let's discover what we can learn from her. To my eye, the first thing I'm impressed with is her assertive use of space: filling but not crowding it, respecting its margins but not afraid of them. Too often, if I can speak for the rest of us, we pull back when we arrive at the end of our paper, unsure of how to handle it, or we're embarrassed by it, or we go into a funk. We truncate, we turn around, we say goodbye. Paloma never does, or so it seems. Related to this is her wonderful, unforced sense of composition, of putting things where they absolutely belong. Haven't we all had moments when, on reflection, our picture would be great if only it were cut off here, or if that part were placed over there? But the dynamic of the chemigram is one-way and hurtles us in the forward direction only. You can't erase, you have to live with what you get. Paloma rides this dynamic with no apparent stress whatsoever. She is of those who appear to favor the chaos of soft resists, which are so difficult to tame but so rewarding in the end, to the rigor of the knife and of hard resists. She is well-suited to it, that much is clear. 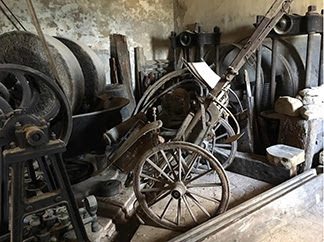 The soft resist in chemigrams has always been the poor cousin of the hard, and in our workshops often tends to be passed over with little more than tolerance and good humor. But Paloma, by her example and the tiny corpus of work produced thus far, goes a fair distance to correct this imbalance. She should be taken seriously, her work should be taken seriously. Let us hope there will be a lot more of it. The young artist at the trays. I asked her what her favorite soft resists were. Marshmallow fluff and peanut butter, she replied. Oh, and canola oil cooking spray, but then we ran out of it. I would have laughed at this a year ago, but no more. She has taught me something. Nolan Preece is giving us more of what we want for the fall season to set us thinking about the natural environment - more chemigrams. His second show at the Wickiser Gallery in New York, ten beautiful 16x20" prints on Epson Velvet, closed a few weeks ago, just as a new one was opening a thousand miles away at the Southeast Museum of Photography in Daytona Beach, Florida (October 9 - November 24). It helps to have frequent flyer miles to keep up with him. We described in previous posts how his work in recent years has shifted from fearless displays of pure darkroom savvy and abandon (www.nolanpreece.com) to a thoughtful treatment of the high desert of Nevada where he lives and which he cares most passionately about, along the eastern slope of the Sierra Nevada range. No one I know of has been working in chemigrams longer, or more assiduously and uninterruptedly, than Nolan, and it shows in the refinement of his methods. Against what we thought were the odds, he has brought chemigrams to bear on ecologic concerns: very few other chemigramists have dared undertake such an effort and none of those few have come near to achieving Nolan's success, or his drama. He has made this ground his own. The unfamiliar viewer should not confuse these images with guidebook pictures. 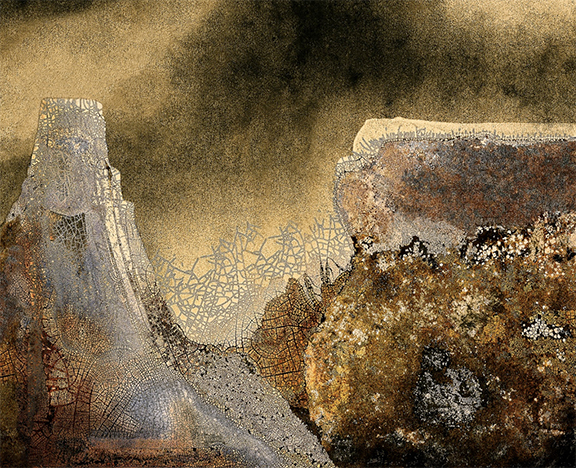 They are the opposite, they are not landscapes but dreams of landscapes, nightmares of landscapes, hallucinations, double-takes, and riffs. They are emotional above all. Nolan, who sees the future, is working under the duress of his knowledge. 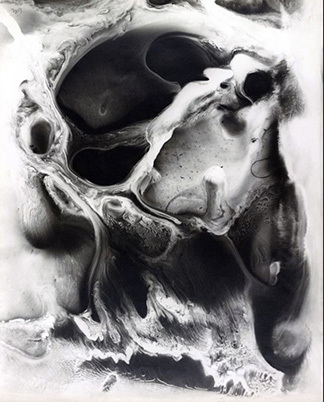 If you've never seen an emotional chemigram you should look at Highlands, or Mesa - although to be fair we must make exception for Nikolova's powerful work in this regard as well. 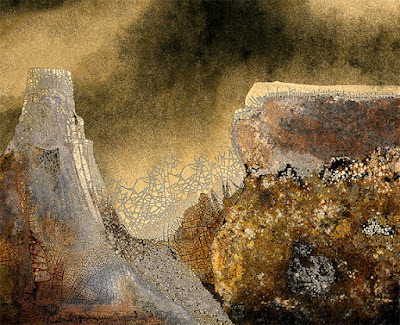 In vain do we seek human presence here, in these canyons and arroyos, so bleak yet so beautifully detailed, but then we realize the enormity of the geologic forces shaping what Nolan has given us. Men would be nothing, they have no place in it. Understanding that may lead us to a kind of reverence, if we let it. If you press me for my favorite, I will go with the one below. Rich in almost boundless mystery, it still has time to leave a wisp of dark mauve in the upper slopes, if slopes they are, as a sign of hope or prophesy, pointing to eons beyond all knowing. 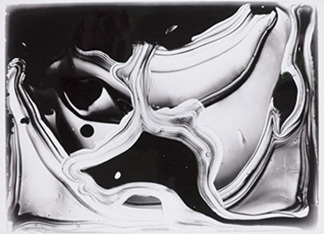 Pierre Cordier, Tate Modern, "Shape of Light: 100 Years of Photography and Abstract Art", London, May - October. Michael Jackson, Photo London, Somerset House, MMX Gallery, London, May 17-20. 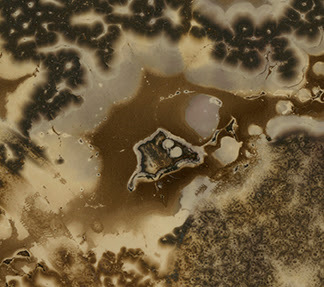 Michael Koerner, Photo London, Somerset House, Edelman Gallery, London, May 17-20. 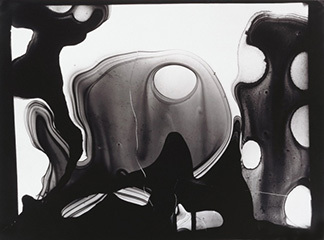 Alison Rossiter, Tate Modern, "Shape of Light: 100 Years of Photography and Abstract Art", London, May - October. 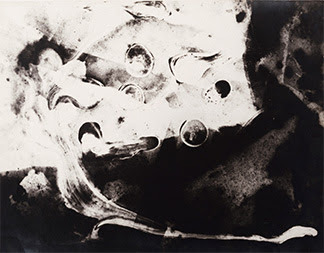 Daisuke Yokota, Tate Modern, "Shape of Light: 100 Years of Photography and Abstract Art", London, May - October. 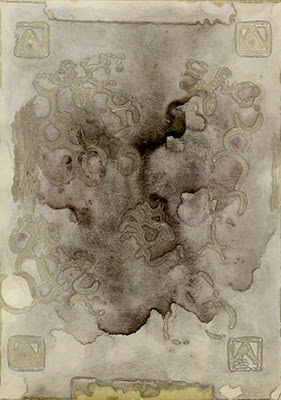 Birgit Blyth, Dineen Hull Gallery at HCCC, March 14 - April 21, Jersey City, New Jersey. Denis Brihat, "A Celebration", Nailya Alexander Gallery, March 27 - May 19, New York City. 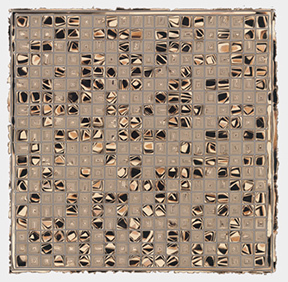 Douglas Collins, Art Intersection, "Light Sensitive", March 6 - April 21, Gilbert, Arizona. 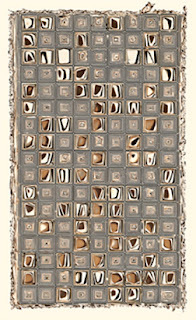 Douglas Collins, ArtExpo, booth 148, Pier 94, April 19 - 22, New York City. Michael Jackson, AIPAD, booth 86, Pier 94, April 5 - 8, New York City. Michael Koerner, AIPAD, booth 402, Pier 94, April 5 - 8, New York City. 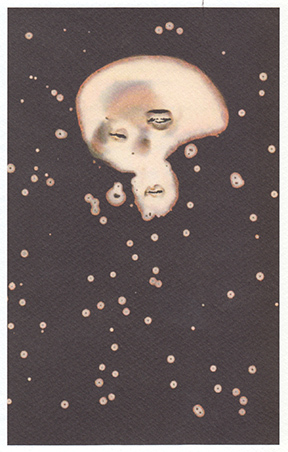 Antonia Kuo, Rubber Factory, May 26 - June 27, New York City. Nolan Preece, International Museum of Art and Science, April 13 - July 8, McAllen, Texas. 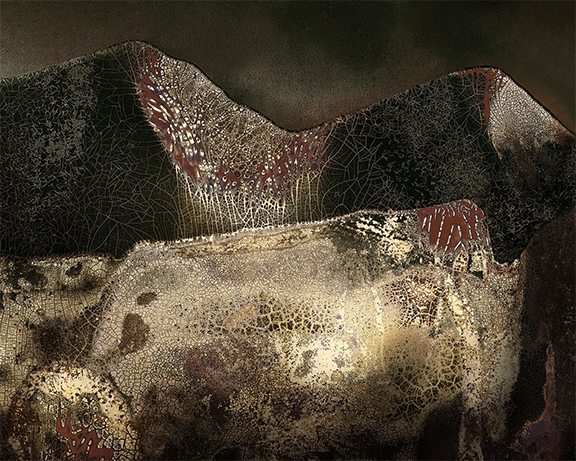 Nolan Preece, Museum of Arts and Sciences, April 27 - August 15, Macon, Georgia. 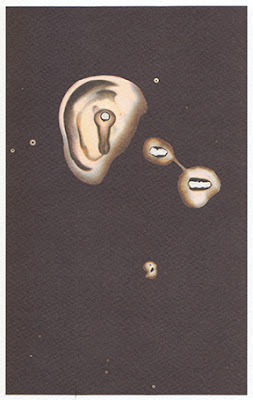 Chemigrams are images produced on photosensitive material by light and photographic chemicals. They require no camera, no negative, no enlarger or darkroom. In fact, you make a chemigram in daylight. 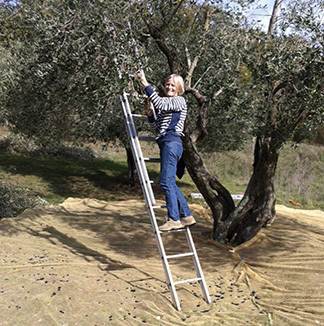 You can make it outdoors in the sun if you like, or in the shade of olive trees. 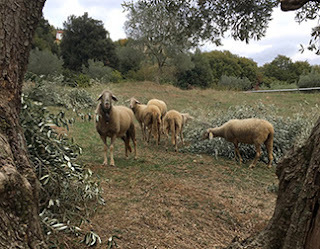 In Serrazzano, a hilltop village in Tuscany not far from Volterra, I make them in an old stable that we have restored to accommodate a printmaking workshop and a photographic darkroom. 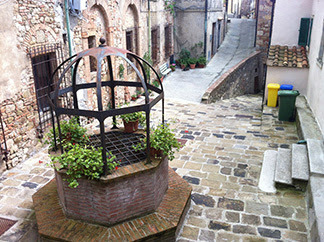 In good weather - and it is often quite good - I work outside, in the courtyard of Villa Beltrami, the manor house, or in the piazza inside the medieval walls. 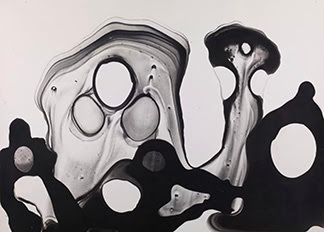 If we speak of the chemigram as a process, we might say that it is all about the action of photographic chemicals, fixer and developer, on the emulsion of photographic paper - or on photographic film, which I favor in my own work. 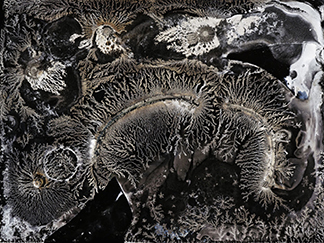 It results in a unique artifact that, if successful, yields mesmerizing and otherworldly imagery like no other photographic or alternative photographic process. 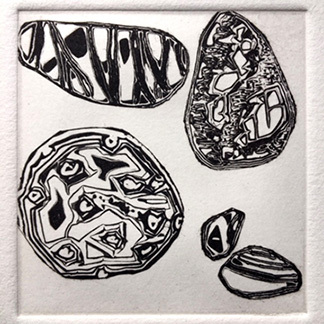 You have no doubt had occasion to study chemigrams throughout this blog; if you care to see a few examples of my own work transforming chemigrams to photogravure, click here or here. 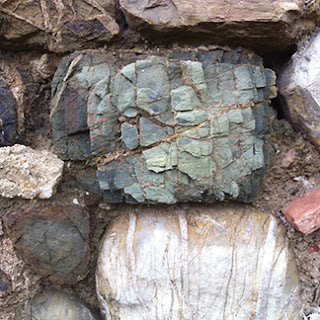 The ancient hills around Serrazzano are rich in minerals, and in earlier times provided the semi-precious stones that embellished the furniture of the lavish villas of the Medicis. Nowadays mining is no longer pursued, but the geological wealth of the region still can be seen in the stones used in all varieties of local construction. 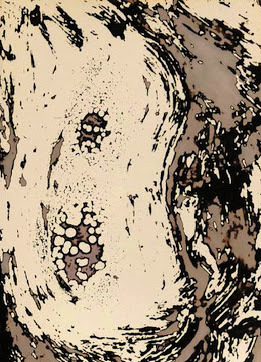 The patterns in them inspire me, and are often reflected in my chemigram images. While some have compared a chemigramist to a poet taking risks, tinkering with lines (the dark are developed lines, the light are fixed lines), I like to think that making a chemigram is a performance. It is a lively performance that features invention and discovery, surprises and screw-ups. The performer must plan, and also be ready to improvise and deal with chance. 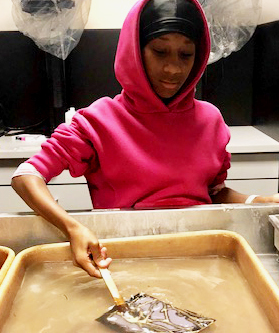 She needs a good dose of luck, a cool head, and the presence of mind to make decisions such as when or if to move the emergent chemigram from one bath to another, or whether to use hot water, or change the temperature of the chemicals or their concentration. 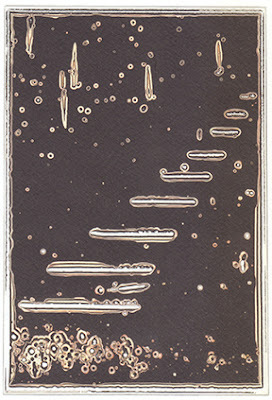 When the performance is over - after a few minutes (rarely), several hours, or even a whole night - the result is a unique object, a chemigram, which is a detailed record of that very same performance. 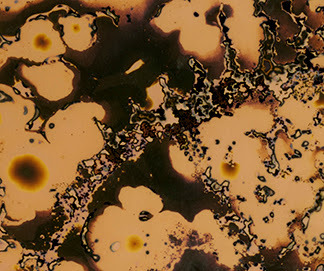 That's because at close examination a chemigram reveals how it came about. In fact, with some experience, one can tell which outline came before another or which shape preceded another. 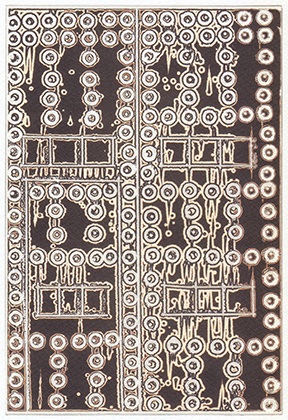 So a chemigram is complete picture of its own history, a remarkable two-dimensional representation of the motion of time. Time is felt everywhere in Serrazzano, and not only in chemigrams: its quiet, steady passing is present in the very earth, the walls, and the ancient buildings. 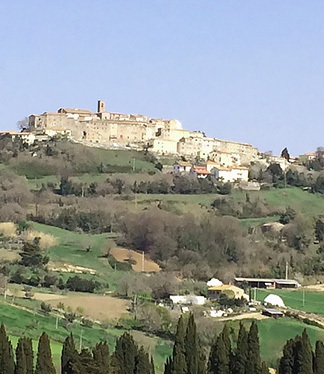 Serrazzano is first mentioned in a document from the eleventh century, but its origins go back to Etruscan times more than a thousand years earlier. After a day spent making chemigrams, I like to relax with a drink on the terrace and idly muse on things, or I may choose to get out and explore the bounty of the region, the profusion of grapes, olives, and mushrooms, in the same way Julius Caesar must have done when his legions marched through here in the first century before Christ, heading towards Gaul. Did they prepare the way for chemigrams? 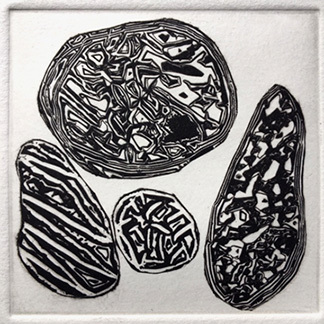 TwoCentsPress - Printmaking in Serrazzano is a project to give fellow artists the opportunity to work and live in an extraordinary setting at a very reasonable price. 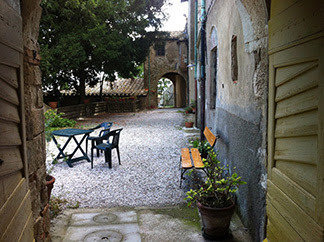 The project includes accommodations within the historic castle of Serrazzano and 24/7 access to a workshop fully equipped for all intaglio techniques and a darkroom for B&W and alternative photographic processes. 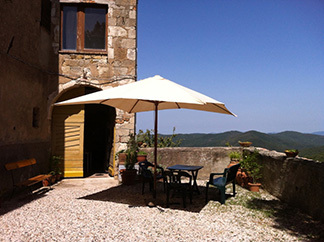 Set in an unspoiled corner of Tuscany, surrounded by pristine and protected forests, it is the perfect place for an artist to concentrate and recharge. It will provide you with an exceptional experience that you will treasure and wish to return to time and time again. Visit us online at www.twocentspress.com or on instagram at twocentspress. You can reach me directly at info@twocentspress.com. Ciao! Why is Chargesheimer so overlooked? He clandestinely cut out one of his lungs to avoid having to serve in Hitler's Wehrmacht. The father, who we know little of, was either a card-carrying Nazi or a Nazi sympathizer, so the young man dumped his given name (Karl-Heinz Hargesheimer), called himself simply Chargesheimer, and left home for good. By 1942 or 1943 he was studying photography, painting, graphic arts, even set design, at different schools in Cologne, and later in Munich. 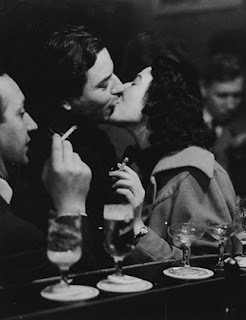 Returning to Cologne, he began working the streets, photographing workers in bars, schoolkids kicking a football, lovers in doorways, mothers searching for food, and all the dispossessed and the lost who were trying to regain a foothold in life: it was the end of WW II and Cologne was in ruins. With his camera it was as if he had uncovered a resilience in his people, and he found a deep joy in documenting it. This would become the theme of a series of books, reviled at first by the city's elders as 'disrespectful' but later celebrated, that he published in the 1950s: Cologne intime, Unter Krahnenbäumen, Im Ruhrgebiet. To support himself meanwhile he sold photos to newspapers and ad agencies, took assignments in theater as set designer, and eventually - the curve of his early years is steep - directed productions of Eugene O'Neill, Jean-Paul Sartre, and Max Frisch. He developed another reputation in Cologne as well, this one darker, more destructive: as the irascible rebel, the original bad boy. With glee he would spit in the face of donors and benefactors as the mood suited him; he loved to shake things up. His 1956 exposition of portraits of the city's leaders in finance and politics caused an outrage: he purposely neglected to fix the photos and in the course of the show they yellowed and deteriorated. Another time, at a certain point in the premiere of Luigi Nono's Intolleranza at the Cologne Opera, he suddenly projected giant swastikas and concentration camp pictures onto the backdrop and set off a near riot in the audience. But in fact, it is his disregard for correctness that leads us to why we're talking about him today. To back up a bit, as soon as he learned how to take photographs and develop them, the much younger Chargesheimer also began experimenting with breaking the very rules he had learned. 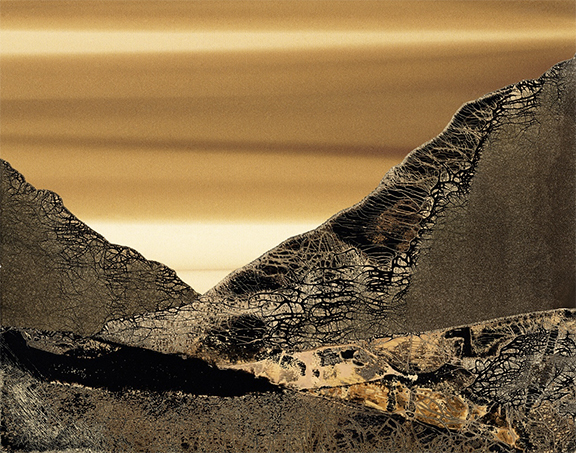 He began making photographs without a camera. What?? Yes, and he mixed materials of different viscosities with fixer or developer, smeared them on paper or glass, then developed the result. OMG. He dripped his chemistry or spun it around or raked it with improvised tools, in a freewheeling manner that owed nothing to anyone. Stop right here. Isn't this, in a way, an extension of a very old tradition going back to Talbot in 1835, passing through cliché-verres and glassprints? Well, you could argue that it is but that's beside the point: he just did what felt natural to him, and he kept pushing it in a direction where one picture led to another and another. 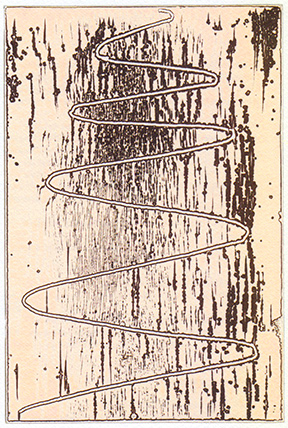 The imagery that emerged was airy, lyrical, full of curves and swirls and streakiness, and it seemed without effort. It still remains breathtaking. 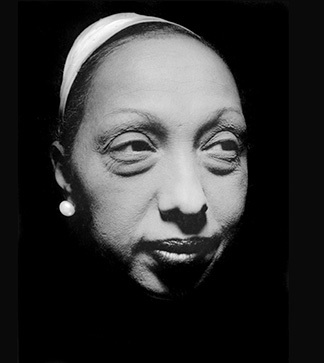 We could go further: this body of work, made off and on from 1946 to 1950, comprising a few dozen pictures at most, is unique in the history of photography and stands apart from everything else he did before or after. Let's look at some examples. By the end of 1940s the rebirth of German photography was well underway. 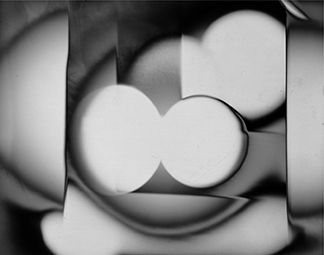 Emerging photographers were revisiting the lessons of the Bauhaus, suppressed by Hitler, and studied the teachings of Moholy-Nagy with his doctrine of the primacy of the emulsion ('the essential tool of the photographic process is not the camera, but the photosensitive layer'). 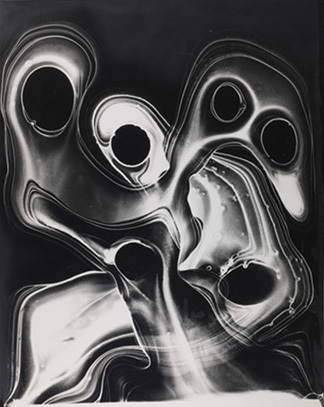 Otto Steinert and Heinz Hajek-Halke in 1949 launched a movement that embraced this thinking called Fotoform, which later splintered into groups like Subjective Photography and Concrete Photography (Europeans are good with balkanization), all the while maintaining a nearly absolute commitment to abstract or non-figurative work. Chargesheimer, keeping to himself, chose his own trajectory but was not immune to the creative currents around him: he participated in the big Photokina show in Cologne in 1950 and again for several years thereafter. When Steinert invited his young student Pierre Cordier to show what Cordier had dubbed 'chemigrams' at Photokina in 1958, it's safe to assume that Chargesheimer saw them. To be generous you could call them delicate, and some of you may really like them which is okay, but you don't go to Chargesheimer for delicate and anyway it's not that, it's less. It's not known what precisely caused this change, whether it was seeing too much Hajek-Halke or whether it was something in his personal life, for he was known to suffer bouts of depression. Perhaps too, as certain critics have speculated, he could have had a foreboding of his own irrelevance with a younger generation advancing on him. 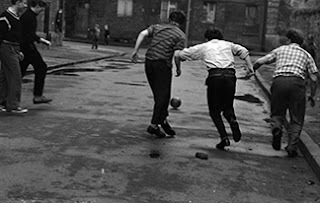 His street photography changed as well, turner colder, unemotional. 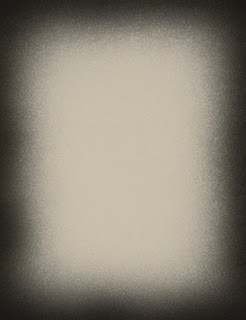 His last book, Köln 5 Uhr 30, with its complete absence of human presence, was received with incomprehension. 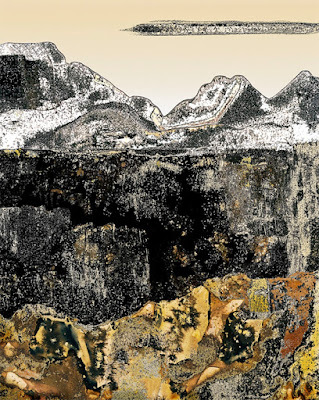 For unknown reasons he went to the Berner Oberland in Switzerland and took photographs of basaltic rocks on the Eiger, entranced by their crystalline fractures. These were the last photographs he made. On New Year's Eve 1971 he committed suicide. His grave in the Melaten Cemetery in Cologne was lost for years to overgrowth and neglect and was only rediscovered in the nineties. Today, a small band of followers gather each May 19, his birthday, to pay tribute. If you have read this far and want to see more of this essential artist, by all means go the Ludwig Museum in Cologne, holders of the major chunk of his work. 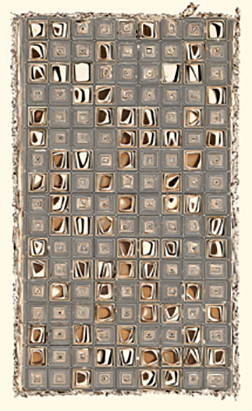 In America, the MoMA, the Getty, the Museum of Fine Arts of Houston, and the Harvard Museums all have bits and pieces. 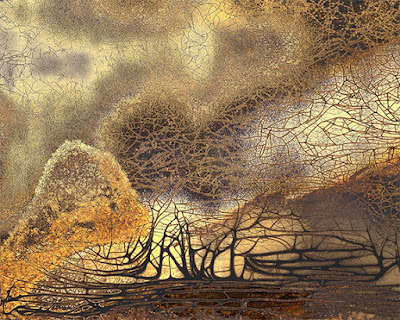 But beware: whether through laziness, inattention, or confusion, many of Chargesheimer's great nonfigurative pictures of the 1940s, the ones we're featuring here and are excited about, are labeled 'chemigram' - a crime perpetuated unfortunately by dealers, auctioneers, curators and museums on both sides of the Atlantic, who don't know what to do with them. Of course these pictures are not chemigrams at all, as any chemigramist can see. Perhaps you have to make a chemigram to know what one is. Besides, the word 'chemigram' didn't exist back then, nor even the idea, the model, of how to do one, go ask Cordier its inventor. If you want to get all technical you could call them cliché-verres or glassprints and we'd be fine with that. Personally I prefer to call them cameraless photographs - or just plain pictures on photo emulsion. You choose. In any event send your indignation to the appropriate museum, starting with the Getty, as of this writing.